When I was a kid I was lucky enough to have a "Super mom". Seriously, with my dad on the road and two (and then later three) kids running around, somehow she always managed to be up, showered, fully dressed with hair and makeup done before she even peeled us out of bed. She would then dress us, make us breakfast and then gather all of our belongings to take us to daycare or school before heading off to her own full-time job. And by the way....our house was always clean (except for my room - and my sisters). When I say she cooked us breakfast I don't mean that she stuck a pop tart in our mouths as we were walking out the door. I mean she would scramble eggs, cook sausage or bacon, and bake biscuits or make toast. Sometimes it was waffles or pancakes and on a rare special day she would make us donuts out of biscuits and create toppings for us to create our own donut designs. She literally had everything going on and managed to do it all, I'm assuming, with her super powers. So, needless to say, I don't really remember ever eating toaster pastries such as pop tarts and toaster strudel unless it was for a snack or I was at a friends house. When I become a college student, its a WHOLE different story. I have seen a ridiculous amount of Toaster Strudel commercials lately and I thought "why buy them when you can make them?" and homemade ones are way better (just ask my former college student self). They are oozy and gooey and yummy and good for your tummy. Your kids will think you are Super Mom too if you make these before their very eyes. You could even let them sweet talk you into taking special orders and all it takes is you switching up the preserves to their favorite flavor. Preheat oven to 350 degrees. 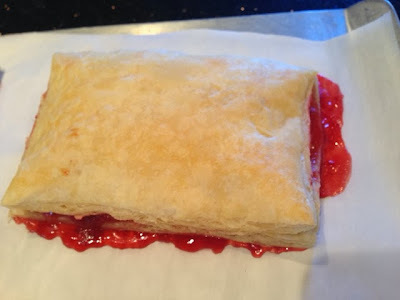 Using the photos below as a guideline, mentally divide the sheet into 6 pastries. 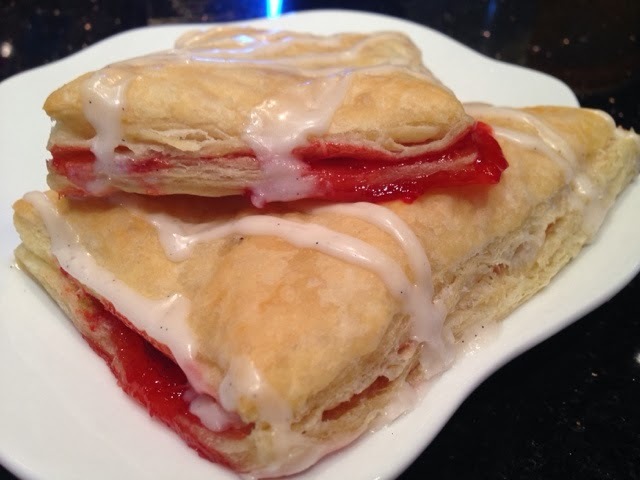 Spread 1 rounded tablespoon of strawberry preserves for each portion of the toaster pastries. Make sure to leave the edges free to be sealed. Brush water along the edges and in between the preserves. 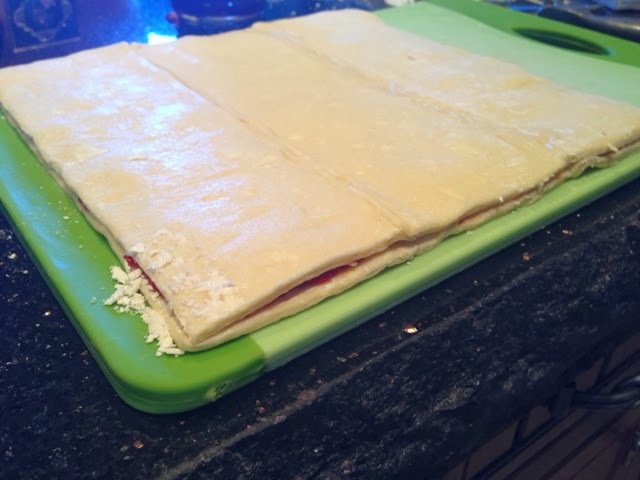 Place the second sheet of puff pastry on top and use a pizza wheel or pastry wheel to cut the pastries. 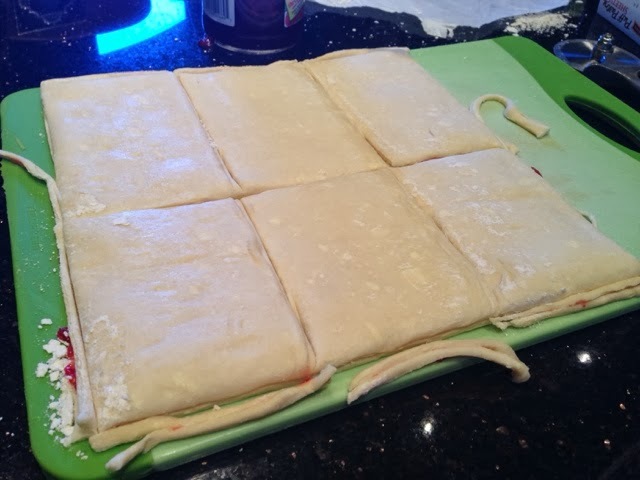 Cut along all edges of each pastry to help seal them. Bake for 25-30 minutes until golden brown. There will be some preserves that seep out of the seams here and there but that's what makes them authentic and not store bought, right? In a bowl, mix the ingredients for the icing well. Spoon into a Ziploc style sandwich bag and push to one of the bottom corners. Twist the bag just above the icing to create pressure. Clip the very tip of the bag and squeeze to drizzle over the warm toaster pastries in a zig-zag or smiley face or whatever shape or design your little heart desires. Place the top sheet of pastry. 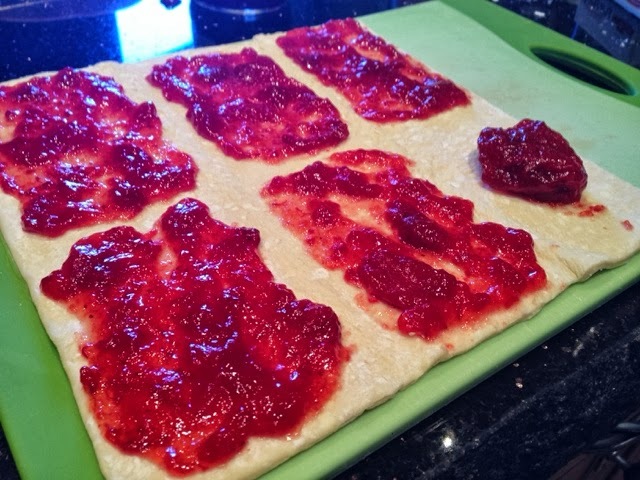 Cut out the pastries and trim the edges to help seal. And....fresh out of the oven (so yum!). I could probably use the Smucker's preserves with Splenda and that would cut out a lot of the carbs. Looks yummy! A good mom is a SUPER MOM for sure. Mine was one also with raising 5 of us, which was a challenge. My dad was a cross country truck driver for yrs so he was gone ALOT. She was a stay home mom until we were much older. Have made this recipe twice now and my second attempt turned out better than my first! First time I used a fruit spread that leaked out all over the place :( For my second attempt this morning I married this recipe with your apple ravioli and stuffed my strudel with homemade baked apple slices....YUM! 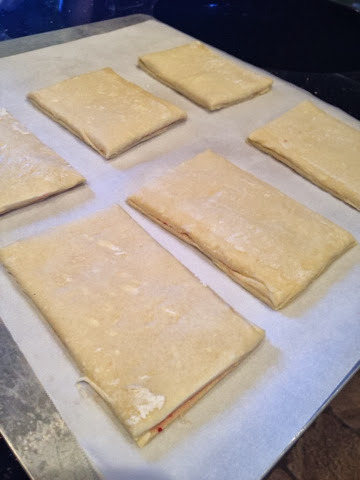 I've been cooking and baking for a long time (am your Dad's age) but had never worked with puff pastry. Not sure why, it was very easy. Keep up the good work, enjoying all your posts. I don't follow any other blogs but being a loyal warrior it's only natural to follow yours! You too will be a super mom one day. Thanks for following! I really appreciate it. I'm glad that you are trying the recipes and yes, puff pastry is awesome and super easy to work with! On the off chance that you don't have to influence a huge bunch of treats at that point to heat your treats in your littler oven. The heating elements or thermostat may not be working or perhaps it doesn't emit the right amount of heat which is why you need to check it.